Children are not small adults. It is important to have an accurate diagnosis of hearing loss in infants and young children and this requires comprehensive tests suitable for paediatrics. 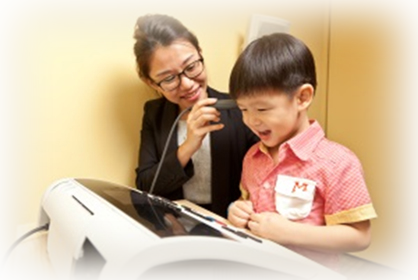 Our team has extensive experience in the assessment and treatment of paediatric patients with all types of hearing disorders. They are well supported by our centre’s specialized paediatric facilities and state-of-the art equipment. A quick and automatic test to check a newborn’s hearing after birth. This is a diagnostic test performed on young children to measure their hearing levels. 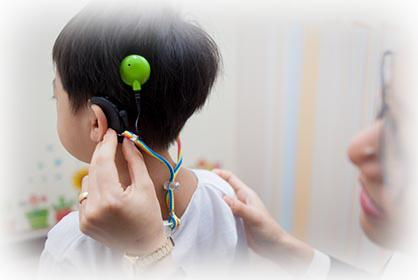 Recording pads are placed on the forehead and behind the ears to record brainstem activity while sounds are played. Also performed on young children, this test measures brain activity while listening to tones of varying frequency and intensity. The results are detected objectively using statistical formulae to determine the presence or absence of a true hearing response. ASSR is usually performed with ABR to evaluate hearing levels. A test used to measure the inner hair cell function of the cochlea, and can be used as a simple screening tool for hearing loss. Similar to adult tympanometry, this middle ear function test is suitable for babies less than 6 months old. This test helps evaluate the hearing in children between 12 and 30 months of age. It uses conditioned head turn responses to a sound stimulus. A video clip (eg. cartoon animation) is often used to reward a correct response. This is a test to evaluate the hearing in children who are 30 months or older. The child is conditioned to perform a listening task by playing a game, such as putting pegs in a board each time a sound is heard.